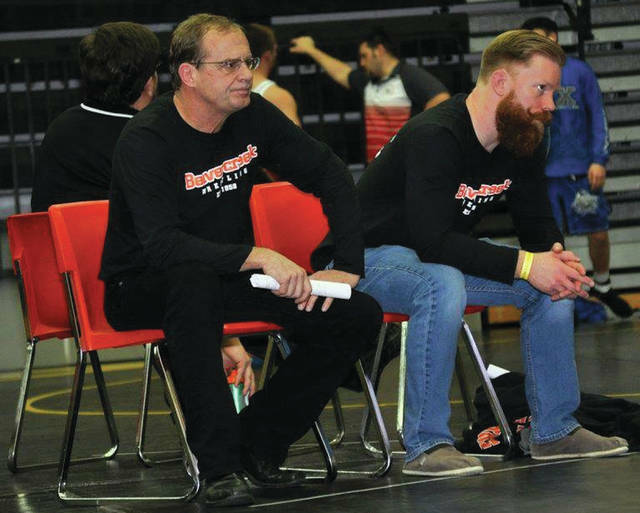 Submitted photos Beavercreek High School wrestling coach Gary Wise has received the Lifetime Service to Wrestling award and is being honored by the National Wrestling Hall of Fame in Oklahoma. Throughout his illustrious career, Wise has made many friends and contacts in the wrestling world. He is pictured with Olympic champion Jordan Burroughs. Gary Wise (left) keeps an eye on one of his wrestlers during a match last winter. BEAVERCREEK — He’s nowhere near being ready to retire. But when he does, Beavercreek wrestling coach Gary Wise wants to be known for one thing. “I would hope that I would be remembered for at least most of the time I did the right thing,” he said. Wise was recently informed that he is being honored by the National Wrestling Hall of Fame, receiving the Lifetime Service to Wrestling award, sponsored by the Ohio state chapter. The award acknowledges that Wise is leaving behind a legacy that others admire and that he has a special place in the heritage of the sport. He will officially be recognized during an October ceremony in Columbus and then he will be part of the hall in Stillwater, Okla., home of the Oklahoma State University Cowboys, one of the most successful wrestling programs in the country. The honor came as a complete shock to the venerable coach, even though he received a request for his bio. Ironically, Wise’s surprise was not shared by others in the wrestling world. A compliment. And the truth. In the late 1970s he was instrumental in starting the Raider Wrestling Club. Utilizing Wright State’s wrestling room, Wise built the program quickly, as it had more than 200 wrestlers within two years. Several years later he took his first high school coaching job, at Madison High School in Middletown, and had immediate success. That first team Wise coached, in 1982-83, had three state qualifiers and one champion, Greg Gephart, who won the 185-pound title. Gephart went on to play football for the Naval Academy. “I was spoiled,” Wise said of that first season. Wise spent eight years at Graham High School in Champaign County and while he didn’t have any champs, he had a plethora of third-place finishers. He came to Beavercreek in the early 1990s and took over for Stamat Bulugaris, who coached wise at WSU. Since then, he has built the Beavercreek program into one of the best in the Dayton area. He’s had a bevy of league champs and state qualifiers, and a pair of state champs — Jeff Lawless (152 pounds) in 1992 and Nick Corba (170) in 2013. Wise has managed to be more than moderately successful. In addition to the wrestlers’ individual successes, he has been Greater Miami Valley Coaches Association coach of the year six times. Since 2006, Beavercreek has had three Greater Western Ohio Conference division championships, three second-place finishes and two overall GWOC championships. In addition to crediting his wrestlers for his success, Wise also gave his wife of 39 years, Lynda, a big shout out for her support in helping raise their three daughters, Suzanne, Andrea and Michelle. “The more this sinks in, the more I reflect,” he said. https://www.beavercreeknewscurrent.com/wp-content/uploads/sites/49/2017/07/web1_IMG_4690.jpgSubmitted photos Beavercreek High School wrestling coach Gary Wise has received the Lifetime Service to Wrestling award and is being honored by the National Wrestling Hall of Fame in Oklahoma. Throughout his illustrious career, Wise has made many friends and contacts in the wrestling world. 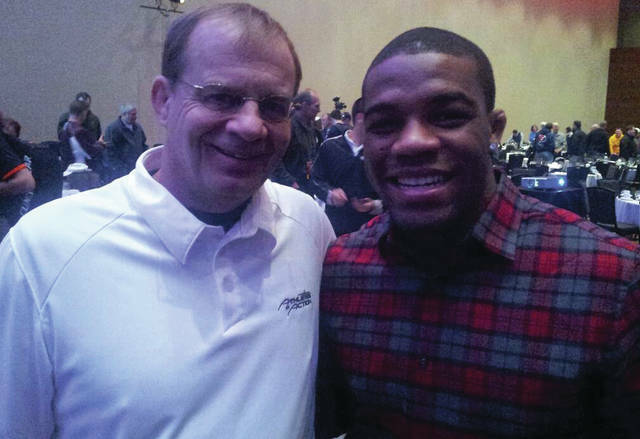 He is pictured with Olympic champion Jordan Burroughs. https://www.beavercreeknewscurrent.com/wp-content/uploads/sites/49/2017/07/web1_IMG_4696.jpgGary Wise (left) keeps an eye on one of his wrestlers during a match last winter.